As a teenager I spent a great deal of time on the river fishing and camping with my friends. Even then comfort was high on our priority list – just under food. Our river trips generally lasted until the food ran out or bad weather set in. Late one night we were trying to get home after a storm had drenched us, and folded up our tents. While traveling on a one-lane back road, we noticed that a tree had fallen, blocking our way. Being the nice guy that I am, I volunteered to get out in the rain and move it. As I approached the tree I noticed how large and awkwardly shaped it seemed to be. I really wasn‘t sure how I was going to move it alone, but I also wasn‘t going to let my friends know that I needed help. After a moment or two, I finally reached down and gave it a budge. About that time this log turned to stare at me, and flashed HUGE teeth! Have you ever noticed how sometimes we don‘t recognize the truth when it appears different from what we expect? 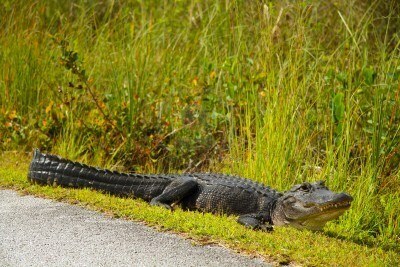 We expect fallen trees; we expect alligators in rivers; we do not expect alligators on roads. Even now I can remember being absolutely convinced that this was just another log. I am reminded of the scripture Matthew 14:22-33. Jesus had sent the disciples across the sea in a boat, and by himself had gone up the mountain to pray. Early in the morning Jesus appeared to them, walking on the water, but they did not recognize him, and were afraid. I have often wondered if they would have recognized him had he instead split the Red Sea like Moses (Exodus 14), or split the Jordan River like Elijah and Elisha (2 Kings 2:8-9, 13-14). Maybe if he had crossed over on dry land like the Israelites did at the Red Sea and Jordan River (Joshua 3:14-17) they would have clearly seen God at work. Walking on water was something new – a different expression of God‘s power. But then, so was Jesus. The expressions of God to which we have become accustomed, were, at one time, new. Often we fail to recognize the movements of God simply because they happen differently than any way we have previously experienced. Remember, that God can be found throughout scripture reaching out to humanity in many varying ways. In our journey to know Christ, be open to God‘s expressions what ever they may be, and lives will change, communities will be transformed, and churches will be renewed. My log-moving experience taught me two great life lessons that I still hold dear. First, some logs should be left alone to move themselves. And second, we should never let what we expect, keep us from seeing what is. Several years ago a close friend planted his very first garden. He was about to be married and had moved into their new home early to get things ready. He was so proud of his garden that he worked in it with every free moment. Everyone who stopped by was expected to tour his “masterpiece.” Unfortunately, about midsummer the rain stopped, and the community was placed on drought precautions. Every night he would call me heartbroken, questioning if I was praying hard enough for rain. Some nights he insisted that I pray over the phone so he could hear. He even started a special prayer group at church praying for rain. The drought continued, and his wedding quickly approached. Never once did he quit praying for rain. He even asked me to pray for rain during the wedding rehearsal. 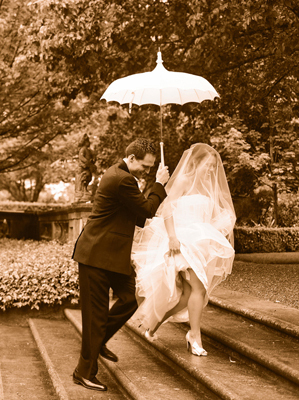 The next day appeared to have been specially created for the outdoor wedding they had planned. Everything was perfect…until lightning flashed across the sky. Without any warning the bottom fell out of the clouds and a massive downpour began. Fortunately we were able to move the wedding to our church across the street.As the groom and I swam to the church all he could do was complain about the rain. How many times do we pray without faith? It seems that we don‘t always expect our prayers to be answered even though Jesus said, “Ask and it shall be given unto you…(Matthew 7:7).” Even if we pray for rain we‘ll wait for the meteorologist to call for it before we carry an umbrella. And when our prayers are answered we just seem to complain that things didn‘t turn out like we wanted or expected. Jesus continues saying in Matthew 7, “Which of you, if his son asks for bread, will give him a stone? Or if he asks for a fish, will give him a snake? If you, then, though you are evil, know how to give good gifts to your children, how much more will your Father in heaven give good gifts to those who ask him!”Many times the specifics of our prayers may not be in the best interest of ourselves or in God‘s plan, but God‘s answers and timetables always are. When you pray…pray as one who KNOWS CHRIST and expects to receive. If you ask for rain then carry and umbrella. You may get exactly that for which you pray, and in the process you will MAKE CHRIST KNOWN. As it turned out, neither the bride nor the groom ever wanted an outdoor wedding. They both only believed that the other did. What a beautiful wedding gift God gave to them, the wedding they both really wanted. One thing is true; don‘t pray for the rain if you intend to complain about the mud! A couple of years ago, I found myself in an all to familiar scene. Our children were in bed, end of the day tasks completed and my wife and I sat together for a few moments of peace before we called it a day. As I tried to read, my wife shared the events of her day. When she told me about a particular problem I laid down my book, and began to tell her how to solve it. Upon finishing, I returned to my book and waited for the usual acquiescence to my wisdom. This time it never came. Instead she pushed my book down and said “I wish you wouldn’t pretend to help. 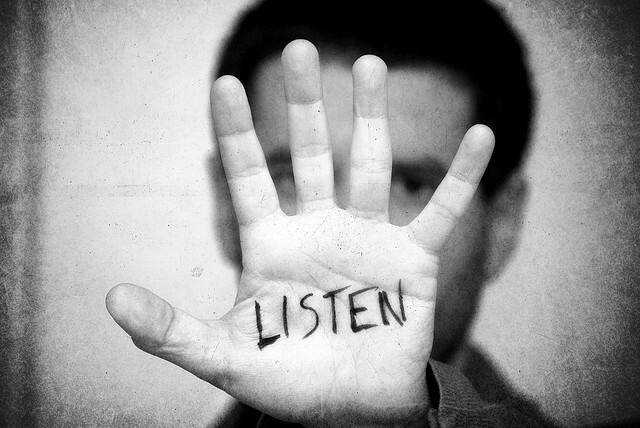 Telling me what to do without listening is not helping.” There was much more to the story than I had assumed. My advice would have made the situation worse. Unfortunately this scene plays out too often in ALL of our lives. We perceive a problem and assume we’re helping by pointing it out or telling someone else how to fix it. It fills us with warm fuzzy feelings of accomplishment and faithfulness. Our conscience is at peace because “we did something.” It’s not our fault if they don’t listen or take our advice. We helped, and now it’s their turn. After all, “God helps those who help themselves,” right? Is it even possible to be more sanctimonious than that? Our lives are made up of countless experiences, decisions and reactions. Sometimes our experiences are similar enough that what works for me will work for you. But no matter how similar we appear…our lives, experiences and situations are different. We come across as insincere and uncaring when we don’t take the time to walk in their shoes, to be in a genuine helpful relationship with them. We are all in relationship with each other. Some are good and helpful. Some are worthless and hurtful. In a genuine christian relationship, we share our journeys and experiences. We learn from each other and both of our relationship’s with God deepens. We don’t come across as judgmental, giving the impression that we care more about things being done our way than we care about the person. Throughout his ministry, Jesus cared for people first. When the woman was about to be stoned for her sins (John 8:1-11), Jesus showed concern for her not her actions. In that relationship she found forgiveness and the opportunity for a deeper relationship with God. These days when my wife begins telling me about a problem I’ve learned to ask, “Ok, how can I help?” before I simply start giving advice.